I personally appreciate the position author Dan Pallotta has articulated about the unjust discriminatory rules that society imposes on charities. In his new book entitled “Charity Case-How The Non-Profit Community Can Stand Up For Itself and Really Change the World.” Dan states that virtually everything our society teaches about charity is backwards. The donating public is told to measure the effectiveness and moral character of charities by how little they spend on “overhead” never being taught that overhead is really investment without which the nonprofit sector can never hope to solve massive social problems. The media and government unwittingly perpetuate these views, condemning charities that invest in behind-the scenes infrastructure or attempt to lure talent away form the for-profit sector. I personally have volunteered thousands of hours on charity boards helping to organize and raise money to assist with the funding of this program or that, and believe me the task is a challenging one at best. Charities are always fight the battle to attract and keep good loyal and committed donors, and those donors frequently are judging the charity on how they control their expenses, and how much of their donated dollar is going to work. Believe me just like any other business, charities can waste money but the charities I have been involved with have been lean mean fighting machines and truly use the donated dollars quite effectively. I understand what Dan is saying in “Charity Case” is that the public sentiment has always been one of suspicion. While we spend money with other private-sector businesses and never once give a thought to how they spend their money on expenses or advertising as long as we receive the good or service we purchased. In my interview with Dan we speak about his movement to help reposition charities in the eyes of the public. Dan has a very interesting proposition about building an anti-defamation league for charities, the purpose would be to unite charities and create an advertising campaign that would inform the public about all the good that they are doing. A great example is the ad campaign that “Got Milk” did that was funded by the Milk Advisory Board which is comprised of dairy cattleman who have united and created advisory board to help build a positive image about milk. Dan states that charities have never united together, and put their resources to work building a positive image for themselves with the public. I personally believe this is a great idea, and one that is long overdue. 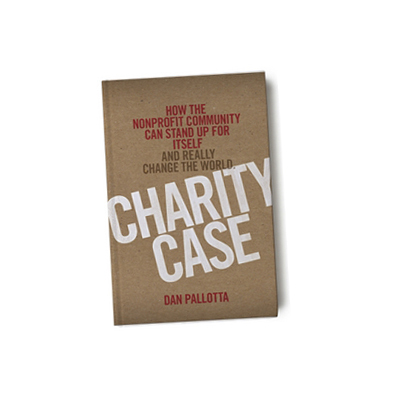 If you are interested in learning more about how Dan plans to help the charities of the world unite and overcome the ill-conceived views of the public I encourage you to read both “Charity Case” and Dan’s previous book “Uncharitable“. You can also learn more by visiting his website by clicking here. Enjoy this great interview with author and activists Dan Pallotta.